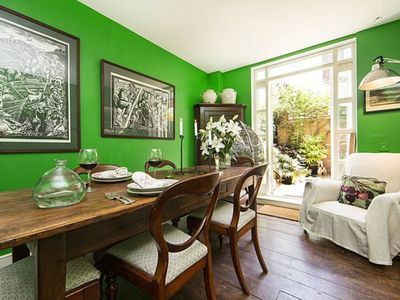 A beautifully furnished London vacation rental in the heart of charming Parsons Green in Fulham, a stunning family home that boasts all the creature comforts one could ask for! Strictly non smoking inside and outside of the building. Beautiful mix of period and modern with luxurious fabrics and choice antique furnishings. Three bedroom period house with private garden situated on a quiet residential street. Very convenient for families. Strictly non-smoking. Internet available. Not suitable for children under 9 years old. The pretty master bedroom has wood floors, stunning ornate rug, period furniture and a UK King size bed (150x200cm). The second bedroom is neutrally decorated and very nicely furnished with period wardrobe, chest of drawers and side tables and a UK double bed (135x190cm). The twin bedroom is on the top floor with 2 single beds (90x190cm) and rear view. The spacious bathroom is white tiled with wood floors, twin basins, good size shower cubicle and a loo. There is also a cloak room with wash basin and a loo. A traditionally decorated double reception room with comfortable sofa, arm chairs, beautiful paintings and ornate rugs. Internet connection is also available. The galley style kitchen is well equipped with modern appliances: Hob/Oven, microwave, fridge/freezer, dishwasher and washing machine and dryer. The super bright dining room has a dining table and seating for up to 6 guests, and this room leads out on to the lovely rear private garden.